Check the boxes below to receive important updates and tips to know from Oak Harvest Financial Group. Stay connected to your money with Oak Harvest's educational investment discussions. Recap of last week's market news and a look into future stock exchanges. Be the first to be notified about future educational webinars. Receive important updates and tips to know from Oak Harvest Financial Group. One of the most important decisions you can make at the retirement stage of your life is choosing with whom to partner to plan and implement your retirement. In our view, the challenges facing today’s retirees, from a financial perspective, are greater than they’ve been in the history of our country. Some traditional advice is to allocate 60% into stocks and 40% into bonds and distribute 3-4% per year. We believe this advice is, in many cases, outdated. We believe it fails to address increasing medical costs, longer life expectancy and the likelihood of needing assistance or care later in life, and fundamentally provides unpredictable income streams. When you were working, your income wasn’t dependent on the market going up every year. We believe it shouldn't be in retirement either. A different approach to addressing today’s challenges may be needed in order to remain financially independent and maintain your standard of living over the course of 30-40 years in retirement. 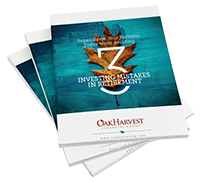 The Oak Harvest Investment Approach, the Core4 and The Oak Harvest Path form a fresh approach to retirement planning for today’s challenging era. By choosing Oak Harvest, you’re partnering with a forward-thinking firm wholly cognizant of the very real challenges that lie ahead. Come and see us, and let’s build a Plan for your retirement. Listen to our radio show hosted by Troy and Jessica Sharpe at 6 p.m. every Saturday on 740 AM Newsradio 740KTRH. Concerned about how market activity could affect your retirement? Get the latest market updates! Join us for an upcoming educational event to better prepare for your financial future. Get access to our E-newsletter! Sign up for our e-newsletter today, and receive important updates and tips to know from Oak Harvest Financial Group. We are an independent financial services firm helping individuals create retirement strategies using a variety of investment and insurance products. Advisory services are provided through Oak Harvest Investment services, LLC, a registered investment adviser. Insurance services are provided through Oak Harvest Insurance services, LLC, a licensed insurance agency. All reports, publications, podcasts, audio files, and the content contained therein provided via this website are for informational purposes only. Content of podcasts is current as of the time of recording. No content available on this site is intended to provide tax or legal advice or personalized investment advice, nor is it an offer or solicitation to buy or sell securities. Views and opinions may change based on new information or analysis. Oak Harvest makes no assurance as to the accuracy of any forecast made. Figures, references, and data cited in all written and audio content are obtained from sources believed to be reliable, but we do not warrant or guarantee the timeliness or accuracy of this information. Investing involves risk the risk of loss, and some strategies may not be right for you. A professional advisor should be consulted before undertaking any strategy or implementing any specific advice. Always consult an attorney or tax professional regarding your specific legal or tax situation. By requesting any report available via this site you may be provided with information regarding the purchase of insurance and investment products in the future. Oak Harvest Financial Group, Oak Harvest Investment Services, and Oak Harvest Insurance Services are not affiliated with any government agency, including the Social Security Administration. For information regarding your specific situation, it is recommended to contact the Social Security Administration. *"Peace of Mind," "Safety," “Principal Protection,” “Lifetime Income, “Guaranteed Income,” or other guarantees are associated with fixed insurance products. No such language refers in any way to investment advice, investment advisory products, securities, or recommendations provided by Oak Harvest Investment Services. Investing involves risk. Rates of return are not guaranteed unless otherwise stated. All guarantees relating to insurance products are dependent on the financial strength and claims-paying ability of the issuing insurance company. Guarantees may be subject to various restrictions, limitations, or fees, which can vary depending on the issuing insurance company. Annuities have limitations and are not appropriate for all circumstances or individuals. They are not intended to replace emergency funds or to fund short-term savings or income goals. Investing involves risk. Lifetime income may be available on certain products through an optional rider at no cost or for an additional cost, depending on the specific product and contract. Taking withdrawals prior to turning age 59 ½ may result in tax penalty fees in addition to ordinary income taxes. Withdrawals from annuities may trigger charges or reduce the contract value and death benefit. Insurance products are not insured by any federal government agency and may lose value. Get access to our Monthly E-Newsletter!